February 15th 2013. Seems like yesterday right? The game was against the Winnipeg Jets, and finally it seemed as though Penguins fans were going to get their first taste of the phenom from California that we had been hearing so much about. Standing at a modest 6'2, and looking every bit of 180 lbs, Beau Bennett looked like the kid that you just let cross the street picking your son up from school. It did not take long however, to realize that there was nothing "elementary" about his game. Beau was here to stay. It just took a little bit of time for us to figure out in what capacity he was going to fit in to the vaunted "system" we have grown to both love and shake our heads at. Now, as we move into the waning moments of the preseason, we have a little bit of a clearer idea. Beau is looking like our newest top six winger. 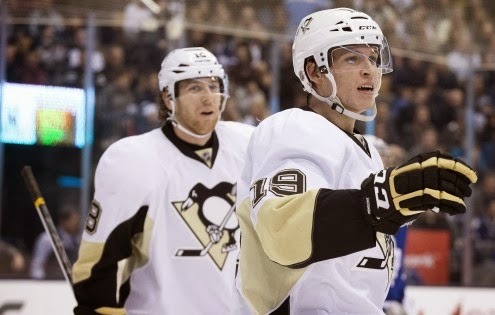 Since he came into the League that February evening, Beau Bennett's strengths became apparent. He is a strong skater that can make tons of room on the ice where little (if any) exists, paired with a quick and strong shot Bennett keeps offensive chances moving. In his first few tastes of NHL action totaling 26 regular season games, Beau posted 3 goals, and 11 assists for 14 points. A +/- of 7 paid tribute to his playmaking abilities and deft real time hockey IQ. something he is going to need playing on a monster line like he is poised to inherit. During his first foray into postseason hockey, Bennett showed us a penchant for the dramatic providing the Penguins with the Game-winner in his first ever playoff game on his first ever playoff goal. Call me crazy, but great sports stories start with something that makes your jaw drop, and that night standing outside the Consol Energy Center watching a giant television loaded on the bed of a Mack Truck, not a chin was left unsullied by the dusty gravel lot. It looks as if now, after a few run-arounds with the top six, Beau is finding his chemistry creating plays with likely future line-mates Evgeni Malkin, and James Neal. Bennett is passing with precision and generally helping his star studded comrades look every bit as dominating as we know they can be. Granted, everything is not perfect. Transitions like this one take time to meld into the picture perfect line we know has all the ability in the world to take over opposing squads with little regard. Like with most lessons, only time will tell how Beau Bennett pans out in his first full on trial by fire, supporting what many regard as the best top six in the NHL. I predict a huge season for Beau. Before you stick me in the corner and accuse me of "homerism" and rallying the troops for an optimistic start to the regular season, know this: I do not think our Penguins will come out of the gate hot. I think it will take a little time to settle down. However, as I look into the Crystal Ball and try to find a bright spot in the sea of unsure preseason perspectives, I keep coming back to a young eager California kid taking the ice in the Black and Vegas Gold, wearing number Nineteen. Beau Bennett will breakout and show the world why the Penguins days of searching for a stop-gap winger to feed the Two-headed Monster is over. Now drop the puck already. Tags # Beau Bennett # luigi lemieux. Labels: Beau Bennett, luigi lemieux.